This is an exceptionally good pudding. The disadvantage is that the fritters can only be cooked at the last minute, so make it part of a relaxed kitchen supper and pass them round as they come out of the pan. 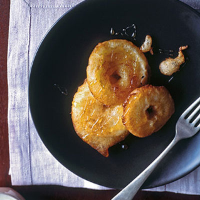 Cider makes the batter extra light and perfectly crisp. Serve them with real custard (not packet) or cream. To make the syrup, stir the cider and sugar in a small pan over a moderate heat until the sugar has dissolved. Bring up to the boil, reduce heat and simmer for 5 minutes. Pour into a jug and leave to cool. To make the batter, sift the flour with a pinch of salt into a bowl and make a well in the centre. Drop in the yolk and about 1/3 of the cider. Whisk together, gradually drawing in the flour and adding more cider until you have a smooth batter. Set aside for ½–1 hour if you have the time. Peel the apples (otherwise the batter will slide off the smooth skin). Core each apple, leaving it otherwise whole, then slice into 5 discs, each about 1cm thick. Turn in lemon juice to prevent browning. When you are ready to fry, pour enough oil into a pan to give a depth of 2cm and heat it up. Meanwhile, whisk the egg white until it forms soft peaks and fold into the batter. Dry the apple slices. One by one, dip the apple slices into the batter, making sure they are completely coated. Lift out on a fork and slide into the pan. Cook for about 1 minute on each side, until golden brown and puffed. Lift out with a slotted spoon and drain briefly on kitchen paper. Serve with a drizzle of cider syrup. This requires a dessert wine with appley undertones and good acidity; Chenin Blanc is the obvious variety.